Template:Nihongo(also known as Women of Ninja Warrior) is a women's obstacle course competition held in Japan and broadcast on the Tokyo Broadcasting System. It is a spin-off of Sasuke, another obstacle course series, and takes place on the same island, Midoriyama. Kunoichi is different from Sasuke in that the competitors are exclusively female. Participants compete for a prize of 2 million Yen($18,618 U.S. dollars). Each competition starts with 100 competitors from a range of backgrounds such as actors, comedians, housewives, and athletes, amateur and Olympians alike. The competitors are mainly Japanese, but many international competitors have participated. Template:Nihongo - This three-time consecutive Kunoichi champion has earned her the nickname "Queen of Kunoichi". Weighing only Template:Convert, Ayako is also an acrobatic dancer, who used to work for Muscle Musical. She achieved total victory in the 4th, 5th, and 6th competitions, and remains the only competitor to have ever completed the final stage. In the 7th Competition however, she fell on the last obstacle of the Second Stage, the last part of the Swinging Beams, which was a metal beam without a rope support like the last two. Her failure left the other competitors in visible shock because, in the words of the narrator "She was the competitor everyone was counting on!" Her current age is 33 years. As of 2008, she has cleared the first stage 4 times in a row and the second,third, and final stages 3 times in a row. Recently Ayako and a few other Muscle Musical members including the creator and Sayaka Asami broke away and created their own group, so it is now rumored that she will no longer compete. Template:Nihongo - This is one of the top competitors on Kunoichi and is notable for advancing all the way to the Third Stage in her first tournament, and failing Domino Hill. (4th Competition) In the 5th Competition, she looked better than Miss Perfect herself, however by the time she reached the Skyway Pole in the final stage she looked defeated and her time ran out. She is a Japanese newscaster and went into modeling after her appearance on Kunoichi. She was also one of only 4 competitors who defeated the First Stage in the 7th competition, but she failed on the Monkey Bars in the Second Stage. As of 2008 she has cleared the first stage three times,the second stage twice,and the third stage once. Rie Komiya also competed in SASUKE 22 but was Disqualified on the Jumping spider. Template:Nihongo - After almost completing the Final Stage in the 2nd and 3rd Competitions, she was thought to be the most likely competitor to complete the Final Stage, and was once thought to be the "Queen of Kunoichi". In the 3rd Competition, Yuko missed the button by 0.10 seconds. Since then, she has only made it to the Third Stage once (in the 5th competition), and hasn't passed the First Stage in the 4th, 6th and 7th competition. Besides being a Kunoichi competitor, she is also a celebrity athlete, and a regular Sasuke competitor. Fans also call her Ms. Kunoichi, for her similar status to Mr. Sasuke, Katsumi Yamada. As of 2008 she has cleared the first stage three times,the second stage three times and the third stage twice. Template:Nihongo - She is a professional snowboarder/wakeboarder. Maho was considered an All-Star of Kunoichi by the second time she has competed. She is known for her impressive speed nearly matching Ayako Miyake's records. Also she made it to the Final Stage during her second appearance, in the 6th tournament, where she completed the Third Stage most difficult obstacle, Domino Hill, at a very quick pace, that exceed any competitors' time who attempted or completed that obstacle (including Ayako Miyake). As she made it past the first Three Stages, it seems that she wasn't nervous about any obstacles standing in her way, but by the time she reached the Final Stage, she was unsure about her footing, constantly looking down, and began to lose speed on the Brick Climb, which by the time she completed time was already up. In the 7th tournament, she was the only competitor to reach the Third Stage, however she was defeated by the obstacle that she had defeated in the previous tournament, Domino Hill. As of 2008 she has cleared the first stage twice,the second stage twice and the third stage once. Template:Nihongo - A mother-daughter team. Though the mother, Yuko, has yet to complete the First Stage, Rena is the second 13-year-old (the first was Saki Suzuki) to complete the First Stage, but she is the youngest to complete the Second Stage. Rena has also competed in the juniors division of Sasuke where she ran out of time just a few inches from the buzzer of the Final Stage. Yuko is a housewife, and her daughter is a tomboy and an athletic student, who joined the track and field team in order to train for Kunoichi. As of today Rena is 15 years old and Yuko is 46. Template:Nihongo - Was the women's group leader in the related series, Muscle Musical. Before the Muscle Musical, she was part of the dance team DIG. Recently she broke away from Muscle Musical and formed her own group with Ayako Miyake. She competed from Kunoichi 3-5 and made it to the third stage all 3 times, but unfortunately failed Domino Hill all three times in exactly the same spot, in the same way. Asami's performances have earned herself a spot as one of the best competitors to date, but will probably never compete again. Template:Nihongo - is a Jazz Dance Instructor hailing from Tokyo. She first appeared in the 3rd competition and wowed everyone by making it all the way to the final stage. Izumi managed a great run but ran out of time just a few feet short of the buzzer. In the following tournament, Izumi was the only finalist from the previous tournament to clear stage 1, however in stage 2 she failed the Triple Hurdle (a common casality in Kunoichi 1 and 2). Since competeing in Kunoichi, Izumi has married and her married name is Mika Makino. Izumi/Makino is rumored to return for the next tournament, but this is not confirmed. Template:Nihongo - A professional sumo wrestler who, due to her large and overweight body, fails on the first obstacle in the First Stage every time. Since the start of Kunoichi, she has participated in all but the 5th Competition. Kunoichi has a more diverse competition than Sasuke; in the 6th competition, over 20 different nations were represented. Kyra Gracie - A member of the Gracie Brazilian Jujitsu Family. She competed in the 6th Competition, but failed the First Stage's Balance Bridge. Catalina Ponor - A Romanian Olympic gold medal gymnast. She failed the "Flying Pillar" in the First Stage. Oana Ban - Romanian gymnastic gold medalist in the team competition at the Athens Olympics. She made it to the Second Stage in the 4th Competition, but failed on the Floating Bridge. Tasha Schwikert - American gymnast, 2000 Olympian, a World Gymnastics Championships gold medalist, and the 2005 NCAA all-around national champion. Finished one second after her time ran out in the Second Stage of the 3rd Competition. Diana Pickler - this American heptahlete from Washington State University competed in the 7th competition, but failed on the First Stage's Log Jam. At least four Sasuke all-stars - Shingo Yamamoto, Toshihiro Takeda, Katsumi Yamada, and Makoto Nagano - are known to be training Kunoichi competitors. Each of them competed in the 7th competition, with their mentors (except for Yamamoto) present. Yamamoto's trainee, Sayaka Okamoto, who is an employee at his service station, advanced to the Second Stage of the 6th Competition (where Yamamoto was present) at just 16 years of age. She failed in the Second Stage, however, falling on the last segment of the "Swinging Beams". In the 7th Competition, Okamoto failed on the First Stage's Log Jam. Like Yamamoto, Okamoto competes in her maroon Mobil 1 uniform shirt. Takeda's trainee, Mieko Oshima, who fights fires alongside Takeda, competed in the 7th Competition and failed the First Stage's newly-redesigned Hop Rocket. Nagano's trainee, fitness instructor Kaori Ongaku, failed the Flying Pillar in the 7th Competition's First Stage. Yamada's trainee, walking instructor Nobuko Onoda, also went out on the Yellow-posted Hop Rocket in the 7th Competition. It was said that they met through Onoda's father, who is a medical expert that Yamada once consulted about a shoulder injury. Nagano has also trained his older sister, Taeko Uchida, who has yet to complete the First Stage. Narumi Kitagawa, a professional surfer, holds the record at age 41 for being the oldest competitor to complete the First Stage, doing so in the 6th competition. She completed the Second Stage that day as well, but did not advance to the Third Stage because she did not turn in one of the 6 fastest times of that stage, a special rule implemented for that competition only. Mio Fukuzumi, who is also notable for her role as Windenu in Ninpuu Sentai Hurricaneger (adapted into Power Rangers: Ninja Storm in the United States), has also participated in Kunoichi. She failed the First Stage after her foot slipped off the dancing stones at the start of stage 1. J-Pop singer Asami Abe competed in the 7th competition, but failed on the very first obstacle, the Stepping Stones. Chie Nishimura, a veteran stunt woman and the only woman to have completed the First Stage of Sasuke, has also competed in Kunoichi. Her first appearance was in the 3rd competition but she failed in the Third Stage after a misstep on the Pole Vault. She initially did not plan to compete again due to her plans of having a baby, but she competed in the 4th competition just three months after having her second baby. She would fail the Hop Rocket on the first stage. She later competed in the 5th competition, where she failed the first stage's Angle Run, and then in the 7th Competition, where she just missed completing the 2nd Stage by a few seconds. Gravure model and BeForU member, Megumi Fukushita participated in the September 2007 Kunoichi contest. She was eliminated in the 1st round after she fell on the Barrel Roll. Kazue Watanabe, a track and field star at a Japanese University, was one of the earlier competitors and former all-star. She was one of 2 people(the other being Yuko Mizuno) to make the final stage in Kunoichi 2. She was the last women standing, but lost her focus and failed the Balance Walk several feet from were Yuko failed. She returned for Kunoichi 3 were she failed Domino Hill's Yellow Zone leaving the competitors in visible shock, in Kunoichi 4 she was the 1st woman to clear stage 1 and made it to her nemesis Domino Hill again only to fail this time in the red zone. Kazue left Kunoichi as the only finalist to never clear stage 3 but was also the only one to clear the 1st and 2nd stages in all of her attempts. Kazue is currently 28 and has moved to London in order to advance in her career. As of 2009, she has cleared the First Stage 3 times, the Second Stage 3 times, and the Third/Final Stage none. Miho Yamada, was a gymnast who competed in the Barcelona and Atlanta Olympics. She is best know for being the first women ever to complete stage 1 of Kunoichi. Yamada would fail the Super Jump afterwards. 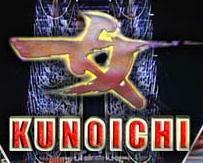 In Kunoichi 2 she failed the Barrel Roll and in Kunoichi 4 she failed the dreaded Domino Hill. Yamada is now 35. Masami Yusa, was a well known competitor in the first 2 tournaments where she completed stage 1 but always failed the Super Jump afterwards. Yusa resurfaced in the 3rd tournament and failed the dancing stones, shocking everyone. In her final 2 tournaments, she would make it past the dancing stones but fail the windmill cross. Yusa is a beach flag champion and is very well known for being the first women to clear the Warped Wall in Sasuke 15. Yusa is currently 35. Yoko Mori, a member of the C.C Girls and is currently 35. She timed out on the final obstacle in stage 1 of the first 2 tournaments. In the following competetion she cleared with about 10 seconds left and made it to stage 3. After a hiatus in Kunoichi 4 she returned for Kunoichi 5,6 and 7 where she failed the Dancing Stones, Flying Pillar and Log Jam. Kunoichi is composed of four stages, with the exception of the 1st and 2nd Competitions which consisted of only three stages each. Competitors must complete a stage in order to continue to the next stage. Note: In the 3rd Competition, the obstacle had a tiny yellow post in the center of the water. This was removed for the 4th and 5th competitions. Note: On Ninja Warrior the obstacle is listed at the Stepping Stones, however; the announcer calls it the Lilypads. Note: In the 2nd Competition, the Second Stage time limit only applied to the first two obstacles. The competitor had 45 seconds to negotiate the "Super Jump" and "Ledge Walk", then had to hit a button to stop time, open a gate and advance to the "Pendulum Bridge" and the "Floating Bridge", which had no time limit. Note: In the 6th Competition, the clock started at zero and counted up when the competitor started the stage. The top 6 competitors with the best times were the ones to move on to the Third Stage. Any competitor that failed to finish within 70 seconds, or fell into the water, was disqualified. Note: In the 5th Competition, the Third Stage time limit only applied to the final obstacle, Dreamers Road. The competitor had to press a button to start a 15-second timer before starting the obstacle and then had to hit another button in order to stop time and advance to the Final Stage. Note: In the 5th Competition, the Ladder Climb alternated from one side to the other. Participants are given 80 to 105 seconds to complete First Stage. In the 1st Competition, the First Stage proved to be a difficult course, as only two people were able to move on to the next stage. This caused a major change in the First Stage, making it less difficult than in the 1st Competition. 9 vertical poles, each topped with a rounded pad, are arranged in an offset pattern. The competitor must step from pole to pole, balancing on the rounded mound, to cross the obstacle. From the 4th Competition onward, the mound on a central pole near the beginning of the obstacle is on a spring, making it somewhat more unstable than the others. Along with the "Hop Rocket", the "Dancing Stones" are responsible for most contestant eliminations. In the 7th Competition, the "Dancing Stones" was a Second Stage obstacle. A set of five small floating pads in a pool of water that alternate sides. The contestant must hop across these five bullet-shaped pads to the other side. This has a similarity to Sasuke's "Sextuple Step". A sloped carousel spins slowly. Three narrow fins radiate from the center, providing a narrow place to safely walk. The contestant must walk across a fin to reach the center of the carousel, and across another fin to reach the opposite side before jumping to safety. Contestants who fall off the fin onto the carousel rarely can avoid sliding down the sloped sides and into the water below. In the 1st Competition, the obstacle was composed of three small windmills rather than the one big windmill used in later competitions. Two stationery round "logs" are placed above a pool of water. The logs are separated forcing the contestant to maintain balance while walking across the logs, but also while jumping to the second log. The second log is about three quarters the size of the first, and is also placed lower and to the right. In the 7th competition, the buzzer that starts the "Flying Pillar" was placed at the start of the Log Jam. The buzzer, when hit, sounded a horn and started the "Flying Pillar"'s downward journey, forcing contestants to move quickly while maintaining balance. A long, flat plank stretches between two risers. The plank can rotate along its long axis. In the 3rd Competition, a fin-like protrusion running along part of the long axis was in center of the Balance Bridge making it similar to the version in Sasuke in the first 7 competitions. In the 4th Competition and onward, 3 large rectangular holes are cut along the long axis. Each of these served to make running straight down the middle difficult. This obstacle was also on Sasuke for eight competitions (1st-7th and 11th). Contestants must balance on the side of a steel barrel as it rolls down a slow incline, similar to the "Balance Tank" on Sasuke. Contestants must cross a set of three balance beams, each only 7 inches wide, while a wind machine blows at Template:Convert against them in an attempt to throw them off balance. The first beam is positioned directly against the wind machine, thus creating a headwind; the second beam is at a 45 degree angle against the fan, and the third beam runs alongside the wind machine, resulting in a crosswind. Contestants must use balance to tiptoe their away along a bridge, about 5cm wide and 60cm long, and then turn 90 degrees and tiptoe along a second bridge. The contestant runs along a riser tilted at a 45 degree angle. At the end of the obstacle, the contestant must jump across the water to a small cushion to continue the course. Starting in the 5th Competition, the contestant would run across one angled riser, then jump to and run across a second angled riser facing the other direction before reaching the end of the obstacle. Assisted by the bounce from a mini-trampoline, contestants try to jump across a large gap and land on a padded riser on the opposite side. In the 3rd competition, it had a small yellow post located in between the trampoline and the other side. The competitor must bounce form a mini-trampoline, to a large yellow post in the center of the water. The competitor must then pull herself up and jump to a floating pad and then proceed to the next obstacle. The Vertical Limit is a combination between the "Hill Climb" and the "Warped Wall" where the contestants must climb a hill with two ropes available. In the 5th competition, it was remade into the Conviction Hill where the contestants ran up two ramps decreasing in height, it is similar to the "Crooked Wall" on Sasuke. Contestants ride a zip-line over a pit of water. Before reaching the end, the contestant must let go of the zip-line and drop to a small cushioned island in the water below. The contestant then crosses a series of narrow balance beams to reach the "Escape Ladder". The contestant climbs a rope ladder to reach the upper platform and hit the finish buzzer to complete the stage. The contestant most climb up a pole to reach to upper platform and hit the buzzer to complete the stage. Very similar to the "Skyway Pole". The contestant must run across five foam floats, two large squares and three narrower rectangles. The contestant must run across a prism-shaped object that is on an axle. Used for only one time on Sasuke. The contestant must use a springboard to catch and hang from a soft pillar, then hold her feet up avoiding a pool of water to land on a floating platform. Similar to the "Log Grip" on Sasuke. Used only once, this obstacle consists of a pair of hurdles, the second of which is about double the size of the first. The contestant must slide down an inclined pole over the water to a floating platform, then follow a balance beam to the "Escape Ladder". In the first five competitions, a competitor only had from 30 to 50 seconds to complete the entire course. In the 6th Competition, it was turned into a time trial, with only the six fastest competitors (assuming more than six complete the course successfully) advancing to the Third Stage. In addition, the 6th Competition's Second Stage carried a 70-second time limit. By the 7th Competition, the course used the original rules, which the competitors must complete the Stage under a certain time limit. There are two sloped round platforms that rotate. The contestants have to jump from one to another to get to the next obstacle. The contestant must cross a spinning log in order to reach the other side. Also on Sasuke for the first two competitions and returned in the 17th competition as the Log Slope. The competitor must cross two sections of ledge at the bottom of a wall, with water below. The second section has two short strips sticking out of the wall at about knee height to increase the difficulty. This obstacle once was on Sasuke. The competitor must cross several floating logs that gradually sink when stepped on. The competitors must cross a bridge while avoiding four swinging hammers. This obstacle is similar to Sasuke's "Hammer Dodge". The contestant must balance a foot on each of two parallel metal poles and traverse them to the next obstacle. The contestant must climb a cargo net. The netting design is similar to SASUKE's "Jump Hang", The function is similar to SASUKE's "Net Bridge". This was one of the two final stage obstacles in the 7th competition. The final stage's net climb is much larger. The contestant must cross two beams that are suspended by rope, with ropes hanging above the middle of each beam to assist in crossing. The first beam is made of a wood. The second beam is made of bamboo. The contestant must then cross a third beam made of metal that is supported by metal poles and lacks the middle assist rope. The competitors must scamper up a 60°, Template:Convert hill. Also found on Sasuke in the first four competitions. A set of monkey bars must be crossed by the competitors. The monkey bars are set on a pivoting mount on the scaffolding above. This is later used on SASUKE as the "Swing Ladder". A third stage was placed before the Final Stage beginning in the 3rd Competition. Like the previous stages, the Third Stage is composed of balance-based obstacles. In the 3rd-4th Competition, each competitor was given 90 seconds to complete the course. For the 5th Competition, the time limit to complete the first two obstacles was eliminated. The contestant starts the timer during the final obstacle. This timer was removed in the 6th Competition to make it similar to the men's third stage. The competitor pole vaults over two bodies of water. The second landing area has an upward incline, making it harder for competitors to land on it without falling into the water behind them. Removed in 5th Competition. This obstacle was also on Sasuke except that there was only 1 platform instead of 2. The competitor balances and walks across 40 upright, foam dominoes. If a competitor loses her balance and touches a domino with her hand, she is disqualified. In the 7th tourmament, it appears that the red zone of dominoes has been changed to something that looks like the "Dancing Stones". Based on Kinniku Banzuke's "Sponge Bridge" event though there is no blue zone. The competitor walks across a Template:Convert wide, plank-like bridge that moves back and forth, like a pendulum, when walked on. It was removed in the 5th Competition, but reinstated in the following one. This was in the 1st and 2nd Competitions in the Second Stage as the "Swinging Beam". It is a combination of the Cliff Hanger and Ledge Walk. The women are given a footholes in addition to 4 handholes. The wall is tilted backward about 10 degrees every gap, meaning the women must cross it leaning backward. There are four sections, with the second and third each rising Template:Convert, and the fourth going down Template:Convert. Replaces the "Super Vault" in the 5th Competition. "Dreamers Road" is a long balance beam over a chasm of water. Before the competitor begins crossing, she must hit a button to begin the 15-second timer. To complete the stage, she must cross the balance beam and hit the final buzzer at the end before the 15-second timer runs out. Replaces the "Pendulum Bridge" in the 5th Competition. It is similar to the original Final Stage, the "Balance Walk", but smaller, and no cylindrical bumps. Added for the 6th Competition and replacing the "Unforgiving Wall", the competitor must jump across to five small platforms of differing heights. Similar to Sasuke's Pillar Path but is spreaded apart. A wall that must be scaled using rock-climbing equipment. To increase the difficulty the second third is leaning backward. No one has attempted this obstacle yet. In the first two competitions, there were only three stages. The Final Stage became the fourth stage beginning with the 3rd Competition. Nobody made the Final Stage in the 1st Competition. The Final Stage in the 2nd Competition involved a long balance beam with cylindrical bumps, over a pool of water. The competitor was supported by a harness. There was no time limit. The Final Stage was revamped for the 3rd Competition, making it similar to the Final Stage of Sasuke. The competitor has 35 seconds to complete two obstacles. In the 3rd and 4th Competitions, it was to climb up a Template:Convert tower using ladder rungs attached to the sides of the walls, then climb a Template:Convert pole to a landing and the finishing button. In the 5th Competition, the ladder rungs alternated, making it more difficult for the competitor to reach the end, since they would have to climb the opposite wall every few steps. For the 6th Competition, the tower was replaced by a Template:Convert "Wall Climb". In the 7th Competition, the wall tower was replaced with a Template:Convert "Net Climb", however, no one has reached this "newest" Final Stage. Unlike Sasuke, Kunoichi's Final Stage competitors are not dropped into a free fall if they fail to finish before time runs out. However, they are still supported by a safety line. The ladders and wall and net slide out of the way when the competitor transitions to the "Pole Climb", but are not timed like Sasuke's "Spider Climb". The program can be seen in the United States as Women of Ninja Warrior on the G4 channel. Just like in the regular version of Ninja Warrior, the play-by-play commentary and interviews with participants are subtitled in English while the introduction, player profiles, and replays have been dubbed by voice actor Dave Wittenberg. Each episode is a 30-minute portion of the Japanese broadcast. It has also been broadcast in the UK on the channel Challenge along side Ninja Warrior. It is dubbed by Stuart Hall. Episodes also feature segments such as "Ninja Killer" (an obstacle from a stage that took out the most contestants), and "Warrior Wipeout" (the best wipeout from a Women of Ninja Warrior contestant). As of now, all 7 competitions have aired in the USA and in the UK. The following is a list of people who advanced the farthest and reached at least the third stage in each competition. Under each competition, the results are listed in order of who went the farthest first. NOTE: Nobody cleared the second stage in this competition. NOTE: In Stage 1 Kazue Watanabe went after Nao Watanabe, indicating she was the 97th competitor to go. NOTE: Momoe Nakanishi wore No. 5 while competeing, however the broadcast states her No. was 10. NOTE: Numbers were not given out in this tournament but the producers had the order in which the competitors went. Only Miyake's and Tanaka's numbers were revealed because they made it to the Final Stage.